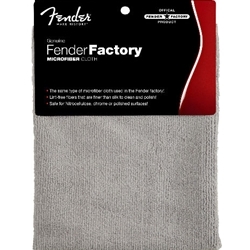 Keep your guitar clean and pretty with the Fender Factory Microfiber Polish Cloth. This is the same cloth that they use in the Fender factory to detail brand-new instruments before they ship them out. Made from soft microfiber material, this cloth won't harm delicate nitrocellulose finishes, chrome, or polished surfaces. Get rid of those fingerprints and the grime with the Fender Factory Microfiber Polish Cloth. Don't forget to pick up a bottle of Fender Spray Guitar Polish to make sure your guitar is looking its best.